You probably don’t think too much about how much you rely on your teeth daily. That is, until you’re missing a tooth or two (or more), and you can no longer eat your favorite foods or speak with ease. You don’t have to live with missing teeth, though. At Canyon Crest Dental, we can provide permanent tooth replacement with natural-looking dental implants. Let us help you reclaim your smile! Dental implants are preferred by dentists and patients alike as a permanent tooth replacement option. Compared to dentures, they require no extra maintenance, and they don’t require certain food restrictions. 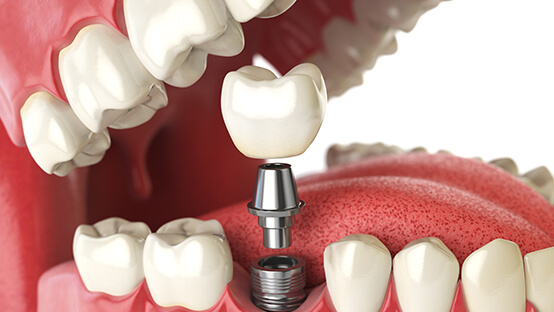 A dental implant consists of a small titanium post placed in the jawbone, an abutment or connecting piece, and a restoration that sits above the gumline. The titanium fuses with the jawbone over a period of a few months, giving us a strong and solid foundation to build up the rest of your new tooth. Depending on your needs and the number of teeth you’re missing, we’ll use a dental crown, bridge, or implant-supported denture to complete the process and make your smile whole again. Dental crowns are ideal for replacing single missing teeth. Bridges are used when there are a couple of teeth in a row missing. Patients missing most or all teeth in an arch benefit most from an implant-supported denture. If you’re missing one or more teeth, call Canyon Crest Dental to schedule a dental implant consultation. At this appointment, you’ll meet with Dr. Grant and our team to go over your replacement options, lifestyle, needs, and health of your mouth. All of this information combines to let us know if you’re a good candidate for dental implants. If your jaw is a little too weak to support an implant, we can perform a bone graft to encourage bone regrowth so we can place an implant. At your consultation, we’ll also go over which restoration – crown, bridge, or denture – we feel is best for your situation. At your first implant appointment, we will surgically place the implant or implants into your jawbone. To keep you comfortable, we offer relaxing sedation options and anesthesia. After the implant is placed, your mouth will need to heal for a few months. The implant will also fuse with your jawbone during this time. At your second appointment, we’ll make sure the new implant has healed and is strong enough for the restoration, and then we’ll place an abutment on top of the implant. This abutment aids in connecting the implant to the visible restoration. We’ll also fit you for your custom restoration. Your third appointment will happen when your restoration is ready. We’ll bring you in for a fitting, bond the restoration if necessary, and give you care instructions.